Sheffield United have completed the deal which brings Scunthorpe striker Billy Sharp back to Bramall Lane. 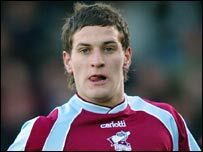 Sharp, 21, left the Blades in August 2005 for £100,000 and returns for an undisclosed fee, with Blades youngster Jonathan Forte joining the Iron. Sharp's 32 goals last season helped the Iron win promotion to the Championship. Boss Bryan Robson told the Blades' website: "He's Sheffield United through and through and he has the desire I'm looking for at this club." Blades beat off competition for Sharp from Norwich, Sheffield Wednesday, Wolves and Preston. Sharp had left Bramall Lane in 2005 after just two substitute appearances to join Scunthorpe. Will Billy Sharp cut it in the Championship? But under the terms of that deal, the Blades will receive 25% of any transfer fee involving the striker. Blades's chairman Terry Robinson said: "We made it known to Billy's representatives eight weeks ago that we would be interested in bringing him back here. "Billy's glad to be back, he knows what we're about and we hope he'll score plenty of goals for us."